I have custom-made white slipcovers on my sofas. They are great because I can throw them in the washing machine after being lounged on by teenagers and the family dog. Could you please share the ceiling, wall and trim colors used here? thank you! Ceiling and trim are Ben. Moore Super White and the walls are BM White Dove. Love the chairs! Where can I purchase them? - Love! Where can I get the chairs? They were from Noir...not sure they carry them anymore. sofa - beautiful english armed sofas...where are they from? they were custom made but Restoration Hardware has similar ones. Beautiful chandelier. Where is it from? The chandelier is from Arteriors. 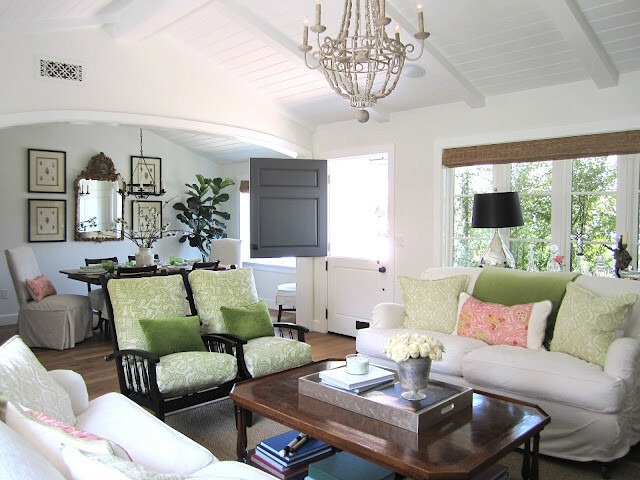 I don't like green but I like a softer cozier feel.